ww2dbaseGusztáv Jány was born in Rajka, Hungary in 1883. He led Hungarian 2nd Army into southern Russia, taking part in actions such as Voronezh and Stalingrad. After the war, in 1947, he was found guilty of war crimes and executed by firing squad in Budapest, Hungary. He was posthumously exonerated of his war crimes in 1993. 21 Oct 1883 Gusztáv Jány was born in Rajka, Hungary. 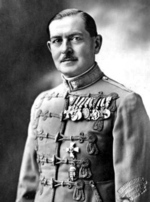 1 Mar 1940 Gusztáv Jány was named the commanding officer of Hungarian 2nd Army. 31 Mar 1943 Gusztáv Jány was awarded the German Knight's Cross of the Iron Cross medal. 5 Aug 1943 Gusztáv Jány stepped down as the commanding officer of Hungarian 2nd Army. 26 Nov 1947 Gusztáv Jány passed away in Budapest, Hungary.